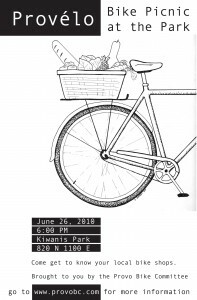 Provelo is the new summer series started up by the Provo Bicycle Committee. The idea is to get as many people on bicycles to the designated park and have a good time. There will be bicycle games, events and, many of the local bicycle shops will be there doing there thing. This is going to be a picnic style event so bring your own food and drink. We will be reporting more on this when more information is available. As for now, mark your calendars get the family together and get ready to have a good time. I love this flier! Yay Provelo! OH MAN! I am so homesick and we haven’t even left for Seattle yet! I know how you feel Tod. This looks like an awesome idea for Provo. Spencer: I am mad jealous of you in Portland right now with the pedalpalooza going on. I hope you are getting out to some of those awesome events so when you get back in Provo you can help us have 243 bicycle events in 17 days 🙂 . You can’t say I am not a dreamer.